Apologies for the awful(ly good) pun! The stick dude is printed from solid PLA. 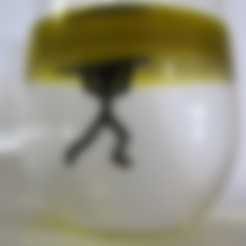 He is more dense than both water and olive oil, but is able to surf on the boundary between the two! This is my entry into the #MakeItFloat competition. I started out by trying to make an object that would float on the boundary between oil and water simply by making it less dense than water and more dense than oil. But unfortunately PLA is quite a bit more dense than water, and it didn't look like it would work. 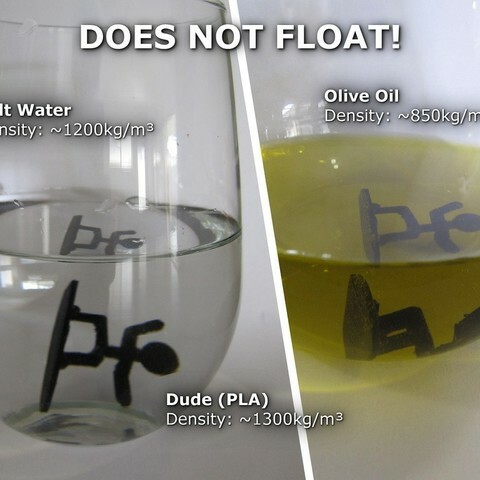 Even the maximum concentration of salt dissolved in water is still less dense than PLA. But during my little test with scraps of plastic I noticed something even more interesting! 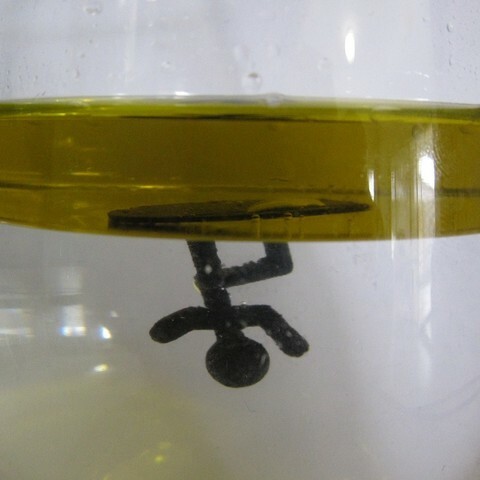 The oil has a lower surface tension and sticks to the plastic (ie. 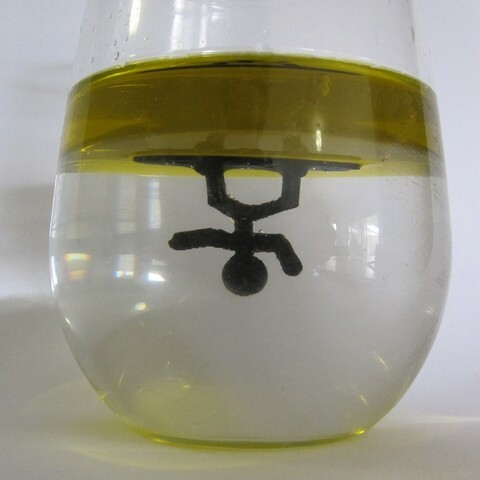 wets it) more strongly than the water does, and the buoyancy of the oil holds the piece lifted to the surface even though it's heavier than both liquids! The surfer doesn't float by displacing a greater mass of water or oil than itself, it is actually held up by adhesion to the floating oil. Tip: dissolving salt in the water decreases the difference in density between it and the dude, which helps make the surfing effect stronger. IMPORTANT: Print with 100% infill! I'd suggest setting your quality settings to maximum to get a good print. The models are very small. For better print quality try printing a bunch of the guys (or add another, bigger object to the print job) at the same time to give each layer time to cool down before the next one starts. "Hands Dude" prints without support, but "Feet Dude" will need supports to be generated. Tip: add a dude to the water before pouring oil in, then lift him to the surface with tweezers. If you just drop him in through the oil he'll end up coated in gobs of it.